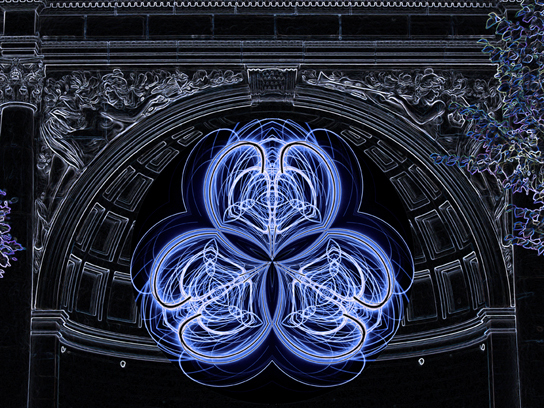 The central drawing was created with several LED lights drawn in the air in front of my Nikon D700 digital camera. The background image is a negative photo of theTemple of Music in Golden Gate Park, San Francisco, and was taken on my Canon S95. Using photoshop attempted to meld the the background into my drawing. While I was taking the photograph, I was serenaded by a single highly talented cellist who was sitting in the center of stage playing Bach. Alas, there were only a couple of people to take advantage of this wonderful moment. I regard my drawing and painting with light as visual music, and my goal is to capture the rhythmic quality and spiritual feeling often found in composers like Bach.